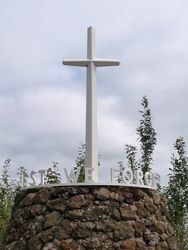 The Avenue of Honour was planted in memory of those from the district who served in World War One. The Avenue is the longest in Australia being 22 kilometres in length. The Ballarat Avenue of Honour is significant as the earliest known memorial avenue to have been planted in Victoria, and appears to have stimulated similar plantings throughout Victoria in the years 1917 to 1921. They predominate in Victoria with the greatest concentration in the Central Highlands around Ballarat. In May 1917, Mrs W. D. Thompson, a director of clothing firm E. Lucas & Co, suggested planning an Avenue of Honour at Ballarat. The idea was accepted enthusiastically with planting beginning on 4 June 1917. 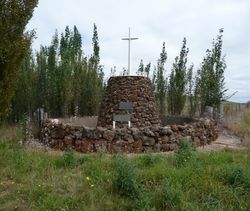 The final planting took place on 3 June 1919. Eleven species, totalling 3,912 trees, had been planted in eight phases by the staff of the Lucas factory with the support of local farmers, who provided tree guards. Each of the plantings was accompanied by Members of Parliament and in some cases by the Premier of the State. The cost of the trees was £2,000, raised by girls at the factory, which employed over 500 women. A further £2,600 was raised to build the Arch of Victory as an entrance to the Avenue of Honour. Avenues of Honour had declined in popularity as a means of commemoration by the time of World War Two. The avenue extends across the Western Highway and ends at a cairn at the corner of Weatherboard and Avenue Roads at Weatherboard. The GPS location for this cairn is -37.426874 , 143.682645. The avenue was re-connected in April 2015 during the duplication of the Western Highway. At Ballarat (Vic. ), on June 4, a commencement was made with the planting of the first 500 trees in the Soldiers' Avenue of Honour. The scheme was originated and organised by the girls at Lucas and Co.'s factory, and when completed there will be a tree planted for each of the nearly 3000 men who have enlisted from Ballarat, The trees planted were elm and mountain ash, and extend for a mile and a half along the Burrumbeet road, which is the main western approach to the city. Each tree is protected by a guard, and each bears a soldier's name. Of the 505 names displayed on the first day of planting, 63 are those of men who have been killed, while several others are missing. Australasian (Melbourne,), 9 June 1917. This Arch of Victory was erected and this Avenue of Honour planted by the young ladies of E. Lucas & Co. Pty Ltd. in honour of the Sailors, Soldiers and Nurses of Ballarat who took part in the Great War. This stone was laid by H.R.H. the Prince Of Wales to commemorate the opening of this Arch. 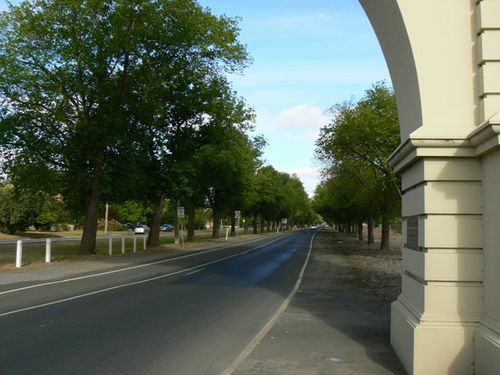 This avenue extends for a distance of 14 miles and contains 3,900 trees which were individually planted by "The Lucas Girls" for every Ballarat Citizen who served in the Great War and assisted in maintaining the liberty of Australia. and every tree reveals a hero s name." This stone was laid by Gen. Sir Wm. R. Birdwood, Bart. G.C.M.G. K.C.B., K.C.S.I, G.I.E., D.S.O. G.O.C. Australia's soldiers in the Big War 1914 - 1919. To Our Fallen. 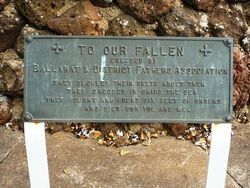 Erected by Ballarat & District Fathers Association. They buckled their belts about them. They crossed in ships, They fought and found six feet of ground and died for you and me. 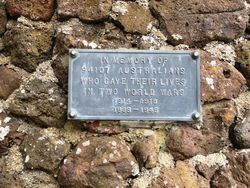 In memory of the 94107 Australians who gave their lives in two World Wars.